, once a noted deistical writer, and the idol of that party, was born at East Harnham, a small village near Salisbury, Sept. 29, 1679. His father, a maltster, dying when he was young, and the widow having threte more children to maintain by her labour, he received no other education: than being instructed to read and write ati ordinary hand. At fifteen he was put apprentice to a glover in Salisbury; and when his term was expired, | continued for a time to serve his master as a journeyman, but this trade being prejudicial to his eyes, he was admitted by a tallow-chandler, an intimate friend of his, as companion and sharer with him in his own business. Being endued with considerable natural parts, and fond of reading, he employed all his leisure to gain such knowledge as could be acquired from English books; for of Latin, Greek, or any of the learned languages, he was totally ignorant by dint of perseverance- he also acquired a smatitering of mathematics, geography, aud many other branches of science. But divinity was, unfortunately for himself, his favourite fitudy and it is said that a little society was formed at Salisbury, under the management and direction of Chubb, for the sake of debating upon religious subjects. Here the scriptures were at first read, under the guidance of some commentator; but in time every man delivered his sentiments freely, and without reserve, and commentators were no longer in favour, the ablest disputant being the man who receded most from established opinions. 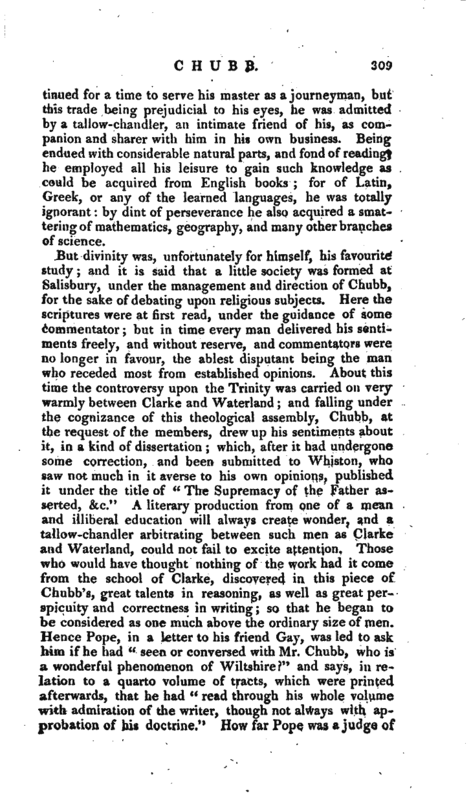 About this time the controversy upon the Trinity was carried on very warmly between Clarke and Waterland; and falling under the cognizance of this theological assembly, Chubb, at the request of the members, drew up his sentiments about it, in a kind of dissertation which, after it had undergone some correction, and been submitted to Whiston, who saw not much in it averse to his own opinions, published it under the title of “The Supremacy of the Father asserted, &c.” A literary production from one of a mean and illiberal education will always create wonder, and a tallow-chandler arbitrating between such men as Clarke and Waterland, could not fail to excite attention. 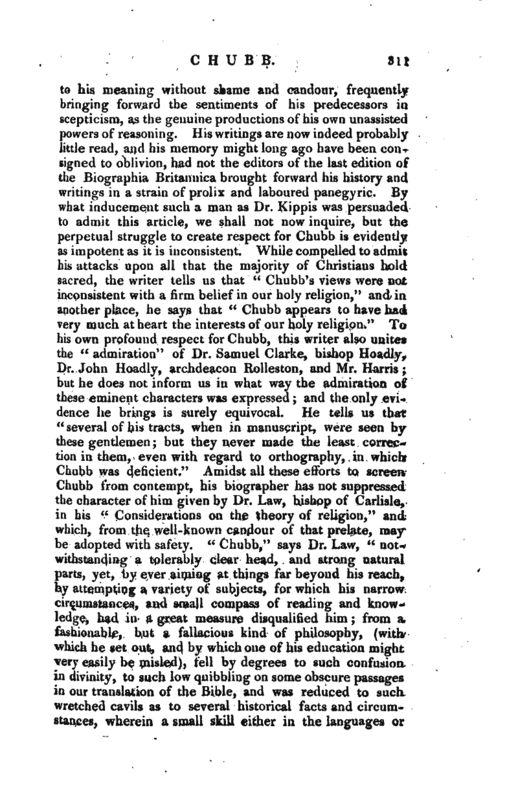 Those who would have thought nothing of the work had it come from the school of Clarke, discovered in this piece of Chubb’s, great talents in reasoning, as well as great perspicuity and correctness in writing; so that he began to be considered as one much above the ordinary size of men. 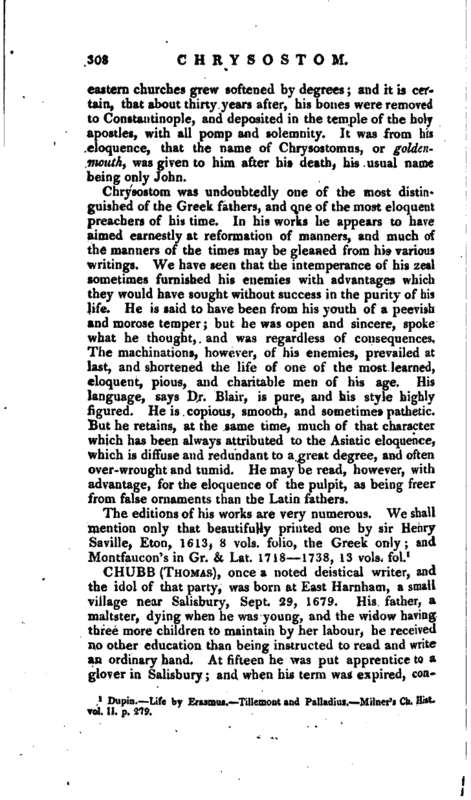 Hence Pppe, in a letter to his friend Gay, was led to ask him if he had seen or conversed with Mr. Chubb, who is a wonderful phenomenon of Wiltshire?“and says, in relation to a quarto volume of tracts, which were printed afterwards, that he had” read through his whole volume with admiration of the writer, though not always with approbation of Jus doctrine." How far Pope, was a judge of | controversial divinity is not now a question, but the friend* of Chubb appear to have brought forward his evidence with triumph. 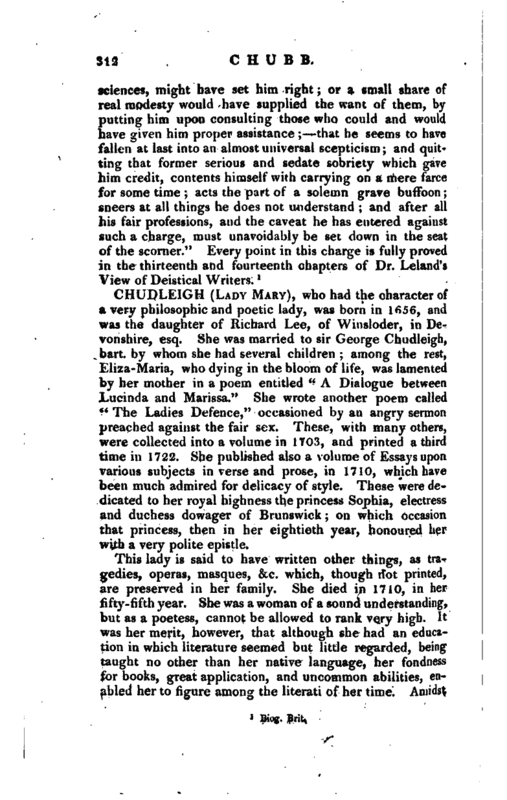 Chubb had no sooner commenced author, than his sue* cess in this new capacity introduced him to the personal knowledge of several gentlemen of eminence and letters, from whose generosity he received occasionally presents of money. 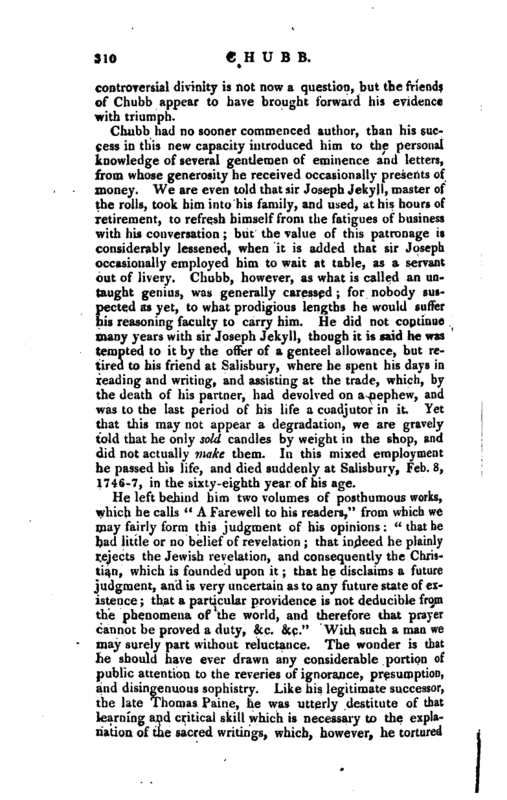 We are even told that sir Joseph Jekyll, master of the rolls, took him into his family, and used, at his hours of retirement, to refresh himself from the fatigues of business with his conversation; but the value of this patronage is considerably lessened, when it is added that sir Joseph occasionally employed him to wait at table, as a servant out of livery* Chubb, however, as what is called an untaught genius, was generally caressed; for nobody suspected as yet, to what prodigious lengths he would suffer his reasoning faculty to carry him. He did not coptinue many years with sir Joseph Jekyll, though it is said he was tempted to it by the offer of a genteel allowance, but retired to his friend at Salisbury, where he spent his days in reading and writing, and assisting at the trade, which, by the death of his partner, had devolved on a nephew, and was to the last period of his life a coadjutor in it. Yet that this may not appear a degradation, we are gravely told that he only sold candles by weight in the shop, and did not actually make them. In this mixed employment he passed his life, and died suddenly at Salisbury, Feb. 8, 1746-7, in the sixty-eighth year of his age.